to daunt the spirits of local pugilists and following confirmation of such activity scheduled for December 17 next, these boxers, being true professionals, have switched gears and are engaged in hectic preparations to close of this year’s activity on a fiery note. Of all the bouts on the 30 rounds extravaganza, the Shawn Cox/ Kurt Bess twelve rounder for the former fighter’s World Boxing Council (WBC) Caribbean Boxing Federation (CABOFE) cruiserweight belt and the welterweight clash where Mark Austin will be seeking redemption against Miguel Antoine following an earlier loss are the fights that will draw the crowd. This will be Bess sternest test to date and he will be required to be at his best if he is to replicate earlier classic performances against Mitchell Rogers and Cleveland Fraser. These wins netted him the local heavyweight and the cruiserweight titles respectively, but most importantly they contributed to a boosted morale coupled with an improved perspective of his ability. In short, Bess has tasted the sweetness of victory and will endeavour to continue along these lines. Cox is no stranger to the local scene having defeated Leon ‘The Lion’ Gilkes in an earlier edition of the ProAm boxing cards. He is a strong puncher with the body of a professional wrestler but lacks the speed and defense mechanisms so vital if he is to defeat Bess. The latter fighter gets into his stride in the latter rounds while the former commences his attack from the first gong. It was with this in mind that Bess’ coach, George ‘Kanchi’ Oprecht is concentrating on changing his fighter’s applications. Bess is currently concentrating on early attacks which could stand him in good stead especially since he could increase the pace as the fights winds down. Maybe, the best indication of Bess’ staunch determination to win is his application in the Andrew ‘Sixhead’ Lewis Boxing Gym, where he is honing his skills. He has already started sparring sessions with Kwesi ‘Lightening Struck Assassin’ Jones and despite not being at his best, has demonstrated the type of application that could see him adding another prestigious accolade to his sizeable collection. Yesterday afternoon he shadow boxed, struck the heavy bag and speed bag before engaging in a hectic session with the skipping rope. Austin was also hard at work and went through a similar programme as Bess. He said that he will turn around the decision and from all appearances is intent on keeping his word. 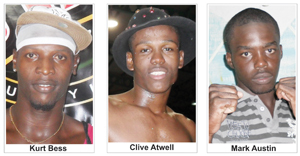 Otherwise, in the remaining bouts, Clive Atwell will attempt to augment his fledgling career with a win over Barbadian based Guyanese, Gardiel Roberts in a 130lbs shindig, while the night’s opener will witness a 4 rounds bantamweight clash between Hewley Robinson and debutant Prince Slowe. The card replaces an earlier planned bout by head of the Briso Promotions, Seon Bristol that would have pitted the skills of Andrew ‘Sixhead’ Lewis against American, Hector ‘Machito’ Camacho. That card has since been pushed back for early next year forcing officials of the Guyana Boxing Board of Control (GBBC) to fill the chasm. The card will be sponsored by Banks DIH Ltd, Castrol, Giftland Office Max, Ansa McAl and Courts. The admission price remains at $1,000 and those attending the card are asked to retain their ticket stubs for a special drawing at the end of the card. The winner will receive two airline tickets to Trinidad and Tobago compliments of Red Jet Airlines.